Van der Lee Seafish has the Penaeus monodon available. This shrimp is also known as the Asian tiger shrimp and the giant tiger prawn. The Asian tiger shrimp is a marine crustacean which is eaten in a lot of countries. We have party shrimps available which are made of the Asian tiger shrimp. We export this shrimp from China since it is farmed there. Along with Thailand, China is one of the biggest producers of farmed shrimps. They started farming shrimps since the 70s because of the growing demand for the crustacean. It first started as a traditional, small-scale business, but nowadays shrimp farming is regarded as a global industry. Most people do not prefer farmed fish, but fortunately we can ensure you that our shrimp is processed, packed and transported in perfectly hygienic conditions, since we know our suppliers personally and monitor the local production facilities. As a supplier we sell our party shrimps cooked, tail on and scale on. Asian tiger shrimps can be identified by their black bars or stripes across their back. They have a mild flavour and their meat is quite firm. When you first bite into the shrimp it has a crunchy, firm and crisp texture. Party shrimps are quite small, so they only contain around 60 calories. However, this depends on the way in which you prepare them of course. Party shrimps are a rich source of protein and iron. 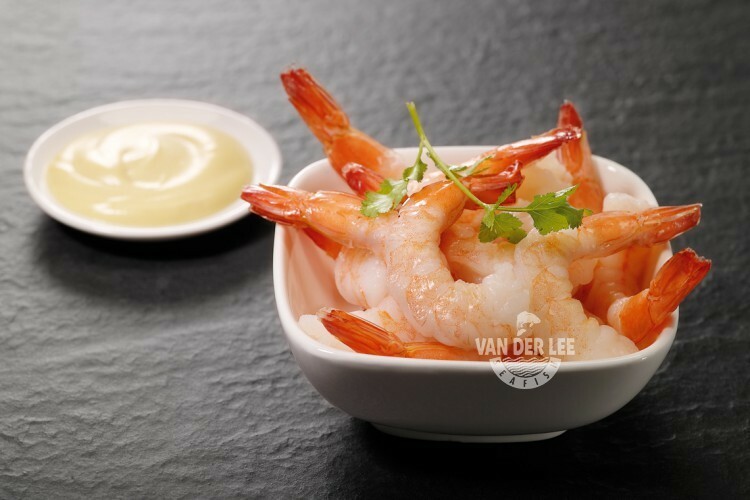 They also contain some vitamins, including the vitamins B3, B12 and D.
Shrimps are popular in a lot of countries, which is also one of the reasons why there are a lot of ways to prepare them. You can thread the party shrimps onto skewers and grill them, but you can also make a delicious shrimp paella for example. Another way to prepare the party shrimps is as scampi. Scampi is a culinary preparation in which they bread the tail of the shrimp. This gives the dish a sweet flavour and succulent texture. However, in the United States they use the name ‘scampi’ for shrimp served in garlic butter and dry white wine and with bread, pasta or rice. Party shrimps can be served alone as a cocktail dish too. They are also delicious with a sauce, such as garlic sauce.